I just finished a month long battle with fruit flies. I tried several things including placing apple cider vinegar in a bowl. This definitely attracted the fruit flies but at the end of the day only two or three of the would drown. Most of the time they would just fly down, touch the vinegar, and fly out. Finally I came upon a solution that worked. 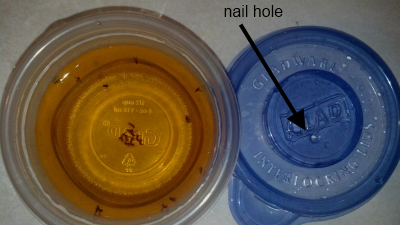 I poured apple cider vinegar into a small plastic container, filling it to about a half inch from the top, placed a lid on it and poked a hole in the lid with a nail. The fruit flies would then crawl in through the nail hole and fly down to the vinegar, touch down, and fly back up. Except this time they hit the lid, panic and fly around frantically until they flew into the vinegar and eventually drown. Why all this anti-science whining and insistence that most DNA is junk? It’s because they believe that random mutation plays a significant role in the creation of the parts of DNA that are functional. To do this random mutation needs a vast amount of play space in order to accidentally yield functional parts. Also the higher the percentage of DNA that is functional the more likely it is that random mutations will break existing functionality and will lead to eventual extinction. This article by Ashutosh Jogalekar explains this perspective in more detail. However, even if a genome consisted mostly of junk it is mathematically impossible for random mutations to produce the design patterns found in DNA. I have already explained that in part here, here, here and here. 1) If the vast majority of our DNA is junk, why is the DNA of humans 99.6 percent identical? Shouldn't junk portion of our DNA be able to vary considerably since it isn't under selective pressure? 2) If the vast majority of DNA is junk, why are 95 percent of human diseases relating to DNA associated with non-coding regions?